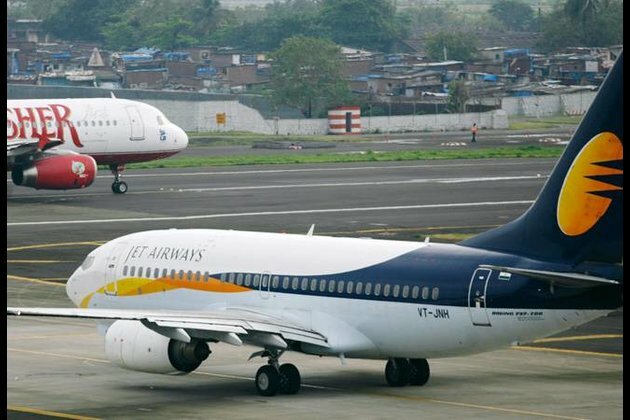 Mumbai (Maharashtra) [India], Mar 18 (ANI): Beleaguered carrier Jet Airways on Monday said it has grounded four more aircraft and cancelled all flights to Etihad's hub in Abu Dhabi. Etihad owns 24 per cent of Jet and is contemplating to hike its stake in a bid to bail out the troubled airline. Meanwhile, UAE Ambassador to India Ahmed Al Banna said in New Delhi that it is for Jet and Etihad to break the impasse in talks. Facing the worst financial crisis of its 25-year existence, the airline has grounded about half its fleet, cancelled flights, delayed salaries and defaulted on the loan and other payments. "Further to our letter on March 13, we now write to inform you that an additional four aircraft have been grounded due to non-payment of amounts outstanding to lessors under their respective lease agreements," Kuldeep Sharma, Jet's Vice President for Global Compliance and Company Secretary, informed stock exchanges in regulatory filings.